One of the most effective ways to make your voice heard is by calling the offices of elected officials. When done well, your call can influence a policymaker to support issues in the best interest of Habitat for Humanity and other affordable housing efforts. Ask to speak to the aide who handles the issue about which you are calling. Your call will be more effective if you speak to the legislative assistant who is responsible for housing issues. This may not always be possible. If you are asked to leave a message, ask for the aide's name for future reference. Identify yourself as a constituent. When your call is answered, give the receptionist your first and last name and your city of residence. Elected officials are most interested in calls coming from peole who can vote for them. Succinctly state the reasons for your call. Have your facts ready when you call and make a few brief points explaining why the issue is important. If you have expertise or professional experience, mention that connection. Clearly explain what you are asking the official to do. Depending on the situation, you may be asking for the official to cosponsor a particular bill, make a proclamation, vote for specific measure, etc. Know what your goal is when you call and articulate it. Be polite. Staff members are likely to receive many daily calls, particularly from angry constituents. Your message will be better received if you speak calmly and clearly. Express gratitude. Elected officials are people too! Thank them for the work they've done and for their time taking your call. While not as effective as a phone call, writing emails and letters to your elected officials are still an important part of advocacy. Elected officials often keep track of how many emails and/or letters they receive on a certain issue. When an official receives many emails about a particular issue, it may motivate them to focus more on that topic. Habitat for Humanity International links to a number of email templates and petitions to make sending a message convenient. Why advocate? Because it works. 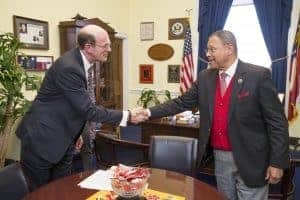 including the HOME Investments Partnership Program, or HOME... [Despite plans to the contrary,] Congress restored funding, and congressional aides credit the restored funds to Habitat’s visits, phone calls and emails... Most notably, HOME received a $50 million increase over the FY2015 level to $950 million in FY2016, which is significant given that HOME funding was proposed to be cut by 93 percent earlier in the year. In November 2015, as a member of the Coalition for Nonprofit Housing and Economic Development, Habitat for Humanity of Washington, D.C., helped secure a unanimous vote by the D.C. Council for a $100 million increase in D.C.’s Housing Production Trust Fund, in addition to a number of other funds for housing-related programs. Habitat for Humanity North Carolina, along with local Habitat affiliates in the state and other partners, advocated for and obtained an increase for the North Carolina Housing Trust Fund from $6.8 million to $7.66 million. That increase was significant, as the fund had been dwindling for many years, even as housing costs had not improved. In West Virginia, Habitat for Humanity affiliates, the Habitat state support organization and other housing partners successfully persuaded Governor Earl Ray Tomblin not to move forward with a proposal to dissolve the state Housing Trust Fund Commission and merge the fund and management control with another state housing agency (WV SB 397). Had the merger occurred, the change in management to the fund would have hurt the effectiveness of the dollars allocated, likely creating confusion and delays. All information excerpted from Habitat for Humanity's "U.S. STATE OF ADVOCACY 2016 REPORT"